Salesforce is not only the most well-known CRM solution, they are also the pioneers of cloud-based software service (SaaS). However, that doesn’t mean they are ideal for every business. Infact, Salesforce could be a poor choice for your small business. 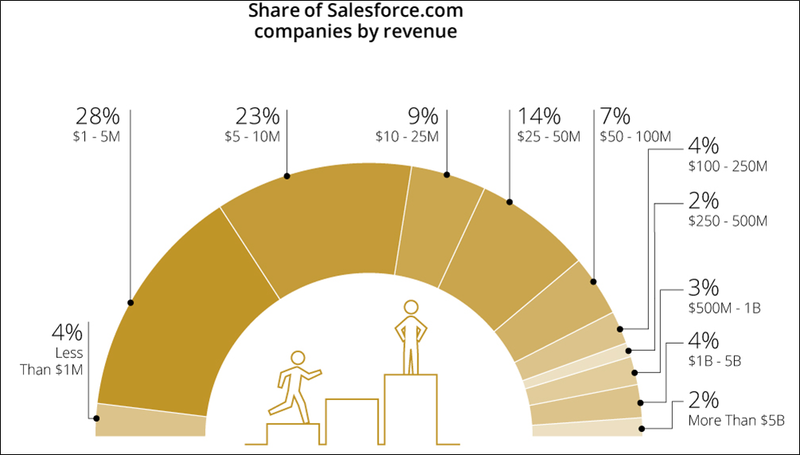 74% of companies who use Salesforce.com have annual revenue between $1M and $50M. Because Salesforce is focussed on “Enterprise” customers, their software is loaded with gazillion features, customization options and complex workflows, while in reality more than of 70% of CRM users would give up the extra features to implement an easy-to-use CRM solution. 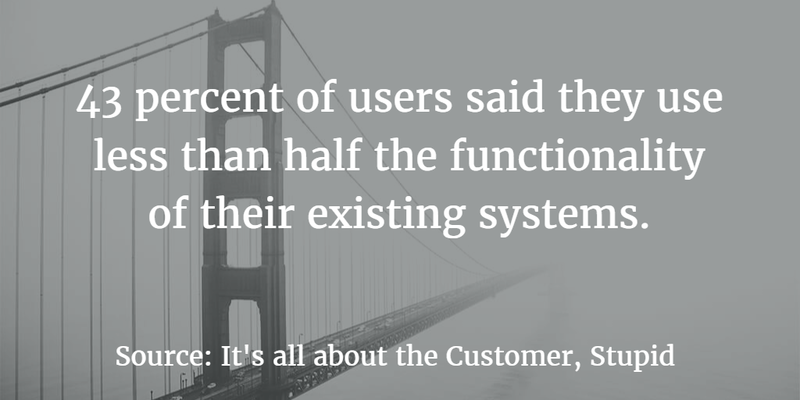 No product or service is suitable for customers of all sizes (one size does NOT fit all). TeamWave has been built from scratch by a small business (digital agency) for small businesses around the world. We have first hand experience of the issues & pain-points of small businesses. More than a decade’s experience of running a small business has gone into conceptualisation and engineering of TeamWave. Why Salesforce cannot deliver desired value and how TeamWave is a good Salesforce alternative for small businesses. Products evolve with time and in case of Salesforce, their focus on larger companies has resulted in complex workflows and features that are more in line with enterprise requirements. CRM customization is important for businesses – it helps a company align the CRM system with own processes and extend the functionality. With Salesforce you’ll get a lot of customization options, but they are also cumbersome and time consuming. 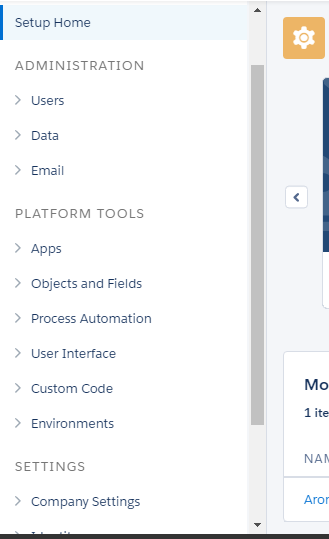 For someone new to Salesforce, it can be very difficult to navigate through multiple options. Note that here I’ve only discussed about something as simple as editing a stage; managing different pipelines is a whole new ball game. If you end up hiring a Salesforce consultant to do the customizations, be ready to shell out around $200 per hour of work. In TeamWave you can edit the sales stages with two clicks: click on settings and click on the stage which you wish to edit. In case of TeamWave, all integrations are built by our engineers and native to our platform. You can activate the integrations right from the app (no concept of app marketplace here). Select one out of the 10 categories of reports – Accounts & Contacts, Opportunities, Leads, Campaigns, Activities, etc. There is also an option to select subcategories. 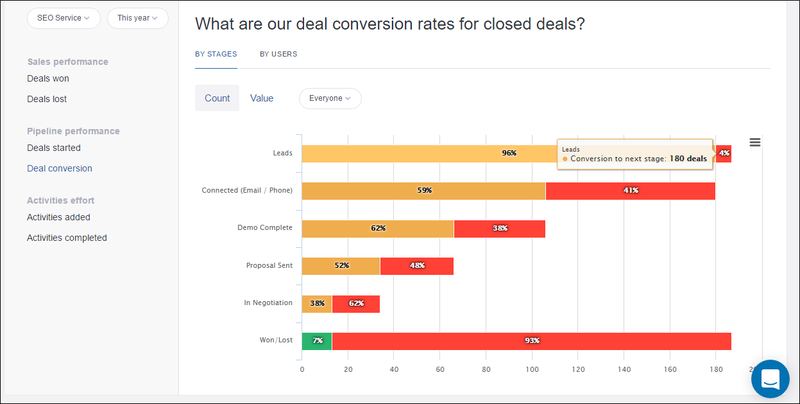 What is the conversion rate of the deals present in different sales stages? Who has maximum deal conversion rate in a particular time period? From which sales stage are we losing most number of deals? In terms of deal value or number, who has contributed the most to the sales pipeline? Which sales rep is completing maximum number of sales activities? Salesforce is expensive for small businesses. It starts from $25/user/month and goes up to $300/user/month. TeamWave has a straightforward pricing – $3/user/month. If you go for annual subscription, the pricing is $2/user/month. Moreover all the plans get all the features and apps – absolutely no restriction. At this time, Salesforce has more than 1,50,000 customers and that makes it very difficult for them provide timely & personalised service to all types customers. Therefore, they’ve created different plans for customer support and issue resolution. According to your support plan, your issue will be prioritized – enterprise/large customers pay more, so they get more attention and enjoy the privileges associated with a key account. 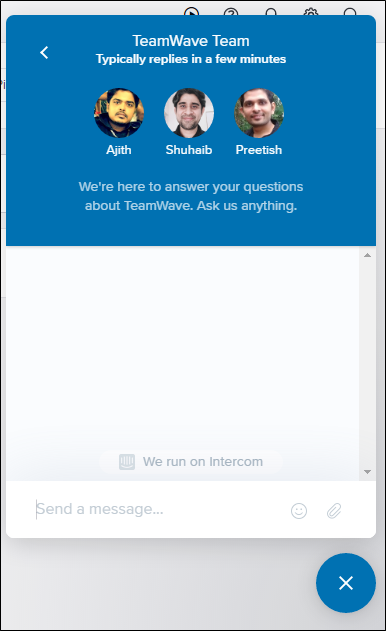 At TeamWave, we’re just a chat window away (thanks to Intercom)! Buzz us whenever you’re in need some clarification or facing difficulty. You can also log support ticket, browse our knowledge base and watch video tutorials. You can copy important files (example: requirement document) from the deal to projects with a few clicks. Can be quite useful when you start delivering after winning a deal. In the HR app, if you add someone as the reporting manager of a sales rep, then the reporting manager will be automatically added as a deal follower whenever the sales rep adds a new deal. This fosters collaboration and helps in progress tracking. Salesforce doesn’t offer Project and HR management app. You’d need to integrate third party apps in the app marketplace to get this done. You’ll end up bearing additional cost and spending more time! Primarily small businesses just need a CRM system to track the progress of deals in a sales pipeline, manage contacts, schedule sales activities and keep a note of the conversation. TeamWave offers all these basic tools for a fraction of the price one would pay to Salesforce, and considering that it is easy-to-use, businesses will save substantial time while setting up the app and training sales reps. If you need advanced features like sales automation, complex third party integration (via API), TeamWave offers that as well, along with Project Management and HR management. Preetish takes care of Product and Product Marketing at TeamWave. He writes about sales, marketing and HR.